When choosing a director for your fifth Die Hard sequel, how do you top the boring mediocrity of Live Free or Die Hard‘s Len Wiseman? Why, you pick a director who wishes he was Len Wiseman, like the guy who directed Max Payne. Do you remember Max Payne? Of course you don’t. Well, the guy who directed that nonsense is named John Moore, and his work is as forgettable as his name. He also directed the what-was-the-point Omen remake, Flight of the Phoenix and Behind Enemy Lines. 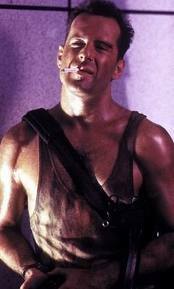 Oh, and he’s going to direct the new Die Hard film for Fox. I suppose there are some who will get upset about this boring bit of news, but I’m not one of them. To me the Die Hard franchise is very comparable to the Halloween franchise in that the first film is a classic and none of the sequels even come close. So it should come as no surprise that Fox is going for the most uninspired choice yet for the fifth time around. To make matters worse, the script, which has John McClane going to Russia with his son, was written by the guy who wrote Wolverine. Ramona Flowers is not expected to return as the daughter. You can thank Deadline for this thrilling news.